Next time you see a person wearing a denim jacket or beaded earrings or bracelet, you might do well to take a closer look. “This is sort of everyday wear that Native people would wear now, and it includes some kinds of things that non-Native people would wear too, but there’s just something about it that shows their native identity,” said Nancy Jo Chabot, curator of the Mount Kearsarge Indian Museum in Warner. 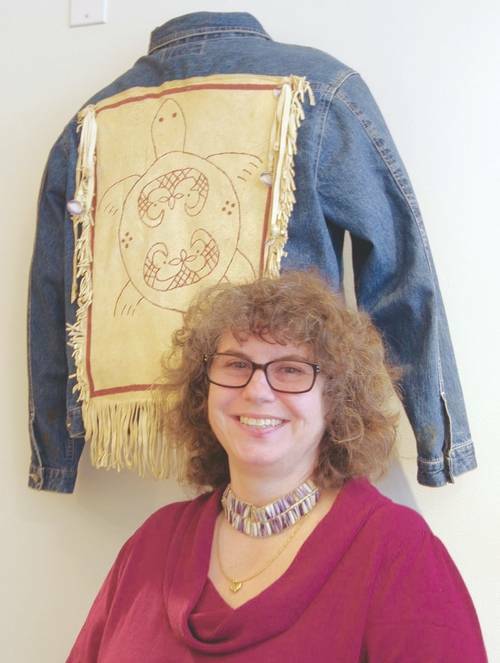 Chabot is the co-curator of a new exhibit at the museum “Alnobak: Wearing Our Heritage” that documents the way in which garments and accessories that reflect Abenaki heritage have been – and still are – made and used to express Native identity, according to museum officials. “You start to see that in little elements in modern clothing,” she said of the portion of the exhibit depicting the current era, “things that wouldn’t look out of place for any modern person walking down the road, but for a Native person have these very distinctively heavy Northeast design elements. Vera Longtoe Sheehan, an Abenaki teaching artist, activist and director of the Vermont Abenaki Artists Association curated the exhibit with Chabot. This exhibit was unique, Sheehan said, in that it is the first traveling exhibit about Abenaki culture co-curated by an Abenaki person and that has been accepted in mainstream galleries such as the Amy Tarrant Gallery at the Flynn Performing Arts Center in Burlington, Vt., in addition to museums. Read the full story by Melanie Plenda in the Union Leader.